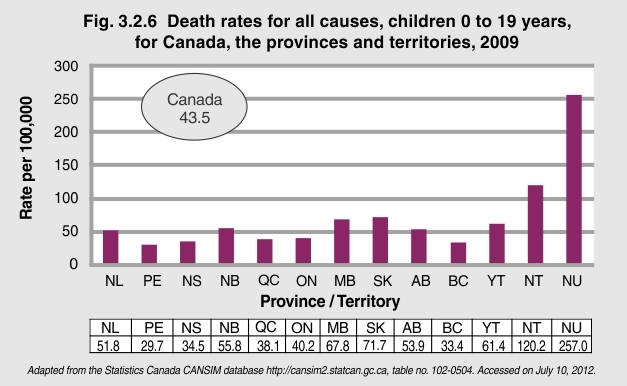 In 2009, 3,423 Canadian children and youth aged 0 to 19 years died, resulting in a death rate of 43.5 per 100,000. There was considerable provincial and territorial variation in the death rates for this age group. The territories had the highest death rates (Nunavut 257.0/100,000 and the Northwest Territories 120.2/100,000). Provincially, Saskatchewan (71.7/100,000) and Manitoba (67.8/100,000) reported the highest death rates for this age group, while Prince Edward Island (29.7/100,000) and British Columbia (33.4/100,000) had the lowest death rates.